First off today I want to thank those who have dropped me a line to say you were about to order the supplements I wrote about yesterday and having read my post, you won't become another victim! I am SO happy! Thanks for taking a moment to write! Secondly, "llp", I am so touched by your many wonderful posts today...I wish I could write you. When you post to me here, I don't have access to your e-mail to write back. If you'd like to chat, please feel free to e-mail me. My address is in the "view my complete profile" link in the right column. I'm always happy to hear everyone's thoughts and I answer when you write. Hugs! Now for your freebie...I love these! I have to admit I'm a girl who loves sparkles! Always have. I remember the first (man-made) ones I ever saw. I was a little girl and my Daddy gave me a birthday card that had sparkles on the front. It was magic! I can still see it now. It changed my world. There are places were sparkles are obvious and expected, but I rejoice to find them in unexpected places like rocks and sidewalks and roadways many times. Hidden treasures that bring a big smile to my face. People are the same way. 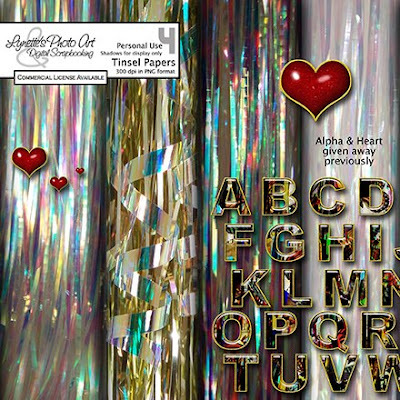 Some people have external beauty that everyone can see like these lovely tinsel papers. It takes no effort to see it and it's joy is fleeting. Then there are other people who you have to put a bit of effort into getting to know before you find the beauty buried within, reserved for only those who pay the price of effort to see it, like the sparkles in the rocks. The result of finding that buried treasure stays with us and warms us down deep. Let's not forget that God does not look on man as we do. He looks within for the true beauty. Physical beauty fades for everyone, but the beauty of a pure and loving spirit cannot be taken from us. I gave you the alpha and hearts that go with the papers not long ago. You can get them in the archives in the left column if you missed them. Thank you for sharing these sparkly papers. Also, thank you for the warning about the Colon supplement. What a terrible scam! Thank you so much for this Freebie. I want to let you know that I posted a link to your blog in Creative Busy Hands Scrapbook Freebies Search List, under the Alpha(s),Font(s), Word Art(s) post on Mar. 06, 2009. Thanks again. Thank you for your lovely tinsel papers - so unusual.